Children are the future leaders, train up a child in the right way, and he/she will not depart from it. Ambassadors and Ministers of the Green Campus Initiative (GCI) are making sure the foundation in sustaining the environment is made solid for the next generation. The Honourable Minister of Education and Advocacy Odunayo Ayodeji Aliu addressed the Homaj School Green Kids Club on Environmental Sustainability. 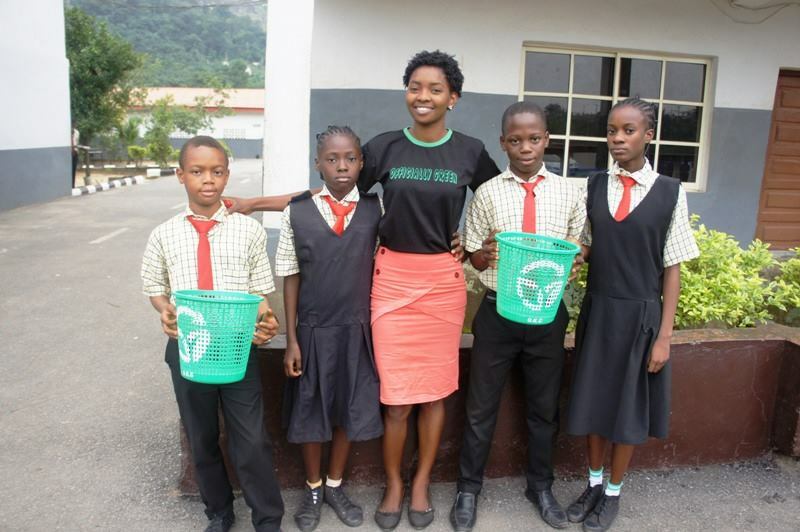 She also presented waste bins to the cleanest classrooms in the school. The kids are taught on how to; recycle waste, make the environment clean and also plant trees in their school compounds. The GKC has extended its tentacles to various schools in Ondo city. The club aims at creating awareness and teaching the younger generation ways of preserving and conserving our natural resources. In GKC, elections are conducted by members to elect the Prime Minister and Green Police to ensure the proper activities of the members and check improper waste disposal and management amongst students and pupils of the school. Green Kids Club, making the world a better place to live in. The Green Campus Initiative (GCI) is not relenting in her mission to tackle the challenges of climate change and environment sustainability through innovative academic research, and translating that into actions on campuses and beyond. Indeed, we have gone beyond campuses into secondary schools and have launched a very innovative and exciting club called “The Green Kids Club” (GKC). What a beautiful legacy to pass on to the younger generation! Can you imagine what positive impact it would have made if we were all taught how to care for and preserve our environment and how some of our actions/in-actions cause adverse effects on the environment from our secondary school days? Maybe we would not have so much pollution problems as we do today. GKC trains her club members to keep themselves and their surroundings clean, eat organic foods, ensure that their wastes are properly disposed, and are even taught how to recycle or reuse some of the materials regarded as waste. They also get to teach others and correct them when due. A couple of schools have actually opened up to us namely: Homaj Schools and St. Stephens in Ondo town. GKC seeks for an average of 15 members in as many schools as possible. From the students, a Prime Minister (Coordinator) would be unanimously elected, and 2 Green Police (responsible for correction and discipline) would be selected. The list of proposed programs for each term includes Seminars, Community development services, Green Party, Green Ball, and a host of other exciting activities. We also hope to launch a Comic Book. This is simply amazing! Spread the news! GKC has begun for real.